I graduate from The International School of Choueifat in 2015 with Advanced Placements and O-Levels in Economics, Psychology, Biology, English, Computer Science and French. I now am in my second year at Brandon University planning to complete my Honours in History and either a minor in French or Political Science. My education outside of school includes lessons in my native language Bengali, classical South Asian dancing, and lessons in Arabic. Firstly, I am highly honoured to be nominated as an Exceptional Female Student by my dearest Emma Varley. I consider this a key accomplishment. I am also proud to be one of many female students in our community, city and province advocating for racial and gender equality, and combating sexual violence on university campuses. When I was 16, I was selected for a national competition to represent my school in the public speaking field. Since then, I have garnered this passion for speaking for the voiceless, to champion human rights and be an activist for a more accessible and impartial post-secondary education for all. My deep investments in the areas of social justice and inclusion would not be possible without many of the organizations I work and volunteer with. My work with the Canadian Federation of Students and Brandon University Students’ Union as one of their Directors has given me the opportunity to campaign against many of the obstacles students face pursuing post-secondary education in Canada. My work with the non-profit fair-trade store Ten Thousand Villages has instilled in me the ethics of caring on an international level. Our economic and just trade with underdeveloped countries has helped millions of impoverished people around the globe, especially unemployed women and disabled people. Furthermore, I have occupied myself alongside the countless resilient voices who inspired me to brave my experience at last year’s Take Back the night. Acts of social activism such as these have made me realize that the grassroots of a movement do not bring about the changes, but that the members themselves are the change. This simple fact has given me such deep inspiration, because I now see how every one of the wonderful and courageous activists who dares put her head above the parapet and voice her concerns about a particular issue is taking part in an evolutionary process. I also consider my scholarly merit as one of my accomplishments. Belonging to a very enthusiastic group of students and completing my degree under the watch of extremely helpful professors has helped me blossom academically. I am highly dedicated towards my research and work every day towards refining my critical and analytical skills. I was born and raised in the Middle East by Bangladeshi parents and am the second of five sisters. Up in an international community, I picked up English very fast and also had the incredible opportunity to grow around a kaleidoscope of cultures – which bestowed upon me a worldly knowledge and respect for diversity at a very young age. Most of my adolescence was centered around school where I made some of the best memories of my life. I was an avid swimmer, often danced at community events, loved baking and spend much of my free time with my nose hidden inside a storybook. I was very shy and had few friends, but those few friends were my whole universe. Though I wasn’t as extroverted and vivacious as I am now, I still look back and reflect upon how my timid and limited life experiences have molded the person I am today. After moving to Canada, I faced some difficulties with making this my new home. The weather was the most difficult part, but as the months faded by and the community around me drew closer to my heart, I began finding solace within the memories that I was continually building here. I have now surrounded myself with loving people who inspire and understand me every step of the way – and that is the greatest blessing I could ever ask for. The Oxford dictionary defines history as “The study of past events, particularly in human affairs.” Human civilization has been around now for over 6000 years and to put it lightly, we’ve done some pretty interesting things that are really worth studying. My education from before university was very science intensive, and perhaps that’s why I developed a unique curiosity for history. The heart of historical study is a richly vicarious experience, teaching you to move beyond yourself and envision other worlds, to explore the interplay between material circumstances and human character. History is both a science and an art, combining the careful analysis of evidence with compelling storytelling. A professor once told me that he does not study religion, but that religion is his way of studying people – and I think that perfectly encapsulates my relationship with history. My philosophy in life would be to be who you are, do what is morally right, and surpass limitations imposed by convention. A quote from one of my favorite books, “Harry Potter and the Order of the Phoenix”, perfectly encapsulates how I feel about my vision of the nature of life: “We’ve all got both light and dark inside us. What matters is the part we choose to act on. That’s who we really are.” It is a reminder that we’re all made of lightness and darkness, and that just because bad things happen to us doesn’t make us bad people, and that it is more often your choices, rather than the situation, that defines the person that you are. I plan to pursue my Juris Doctor at University of Manitoba’s Robson Hall Faculty of Law after I complete my Bachelor of Arts; so I see myself as a practicing Human Rights Lawyer in the future. I hope to embark on humanitarian aid and to research sustainable solutions in the Middle East and Africa regarding armed conflicts, famine, refugee crises, and the socio-economic realities of affected women. Other than my career ambitions, I hope to be settled down with someone I love and travel to all the countries I have always wanted to see, experience, and explore. It is with great pleasure that I nominate Israt Lisa Mizan to receive recognition by the Status of Women Review Committee as an Exceptional Female Student. Since joining Brandon University in 2015, Lisa Mizan has contributed in remarkable ways to reshaping the campus’s scholarly and extracurricular activities, policy and outreach. As the Brandon University Student Union’s International Representative, she works diligently to support students new to Canada, many of whom are in the process of not only acclimatizing to Canadian society, but also becoming new citizens. Of especially great importance are Lisa’s outstanding efforts to advocate for racial and gender equity, and combating sexual violence on university campuses. For example, by bravely sharing her own experiences as a sexual assault survivor for Brandon University’s 2016 Take Back the Night event, Lisa inspired many other survivors to seek necessary support and recognition. Lisa’s activism in this area has also included volunteering with the Women’s Resource Centre, and she has been invited to contribute to the development of a survivor-centred sexual assault policy by nursing students from the Faculty of Health Studies. 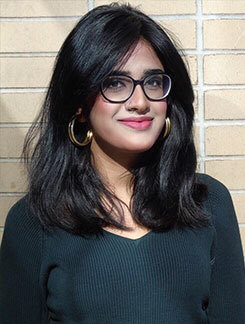 Her growing expertise has also led to her appointment as the Co-Organizer of the International Student Gathering, which seeks to address international students’ experience of racism and prejudice. And, more recently, she was invited to join RISE (Racialized and Indigenous Students Experience), with which she works to develop strategies intended to challenge and redress students’ structural exclusion from education and opportunity. Lisa’s deep investments in the areas of social justice and inclusion are further reflected by her wide-ranging volunteer activities with a number of local social and governmental organizations. For instance, and in ways which reflect her own experiences as a newcomer to Canada, she regularly works with the Westman Immigrant Services and provides weekly English language tutoring to newcomers as part of Calvary Temple’s outreach services. Each week, she also volunteers with the fair-trade organization “10,000 Villages”, which operates a Brandon-area store. Her association with this organization permits Lisa the valuable opportunity to advocate on behalf of minority, disabled and women workers in India and Bangladesh, and to raise awareness concerning their need for urgent improvements in pay and the conditions in which they live and work. The significance of Lisa’s diverse activities and contributions is matched by her scholarship. She is a full-time second-year student in the Bachelor of Arts Degree, with a major in History and a minor in French, and achieves high marks notwithstanding her many extracurricular commitments. She is an active member of the History Club, and participates widely in all on-campus scholastic events, guest lectures, and student meetings. On the basis of her academic strengths, Lisa was also hired to be the Student-Instructor of “Political Studies” for the Brandon area Career Trek Program. Lisa Mizan serves as a source of inspiration for many members of the campus community, and women and international students especially. Her heartfelt commitments to the principles of gender and racial equality and to combating sexual assault on university campuses inform everything she does, and every one of her successes. These achievements, and her ability to empower and inspire women especially, deserve to be commended. For these reasons and many more, Lisa represents the best and brightest of our students, and stands as a role model for young women and men alike. It is therefore my honour to nominate her to receive recognition as an Exceptional Female Student by the Status of Women’s Review Committee.